Do you love to hear music? Well, everyone loves to listen to music. Nowadays people mostly use their phone for listening music. Now we can listen and share and download music easily through our phone. While it’s easy to download songs on android but its little bit difficult for iPhone users. So, here I will let you know how can you put and play music on your iPhone. Well, first of all, it isn’t that tough. iPhone is known as world’s safest phone. Yes, to that’s why people use it without any worry. iPhone is offering you high-level safety, and for ensuring your safety, it has some delicate features like you can’t share files without an internet connection, you can’t play download music quickly, and you have to save your music on your iTunes via computer then you can listen that music and much more. Don’t worry! Putting music on your iPhone is easy. Scroll down to know how can you put and play music on iPhone. So, you want to know put music on your iPhone. Well, here I am sharing two simple methods with you. Here are those methods. 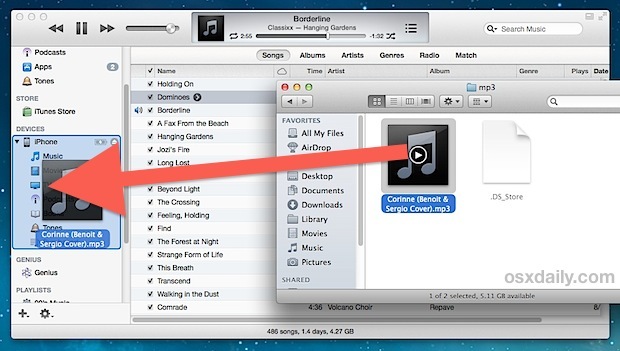 Select music and drag it to your iPhone’s folder which is on the left side of your iTunes software. So, this how you can put music on iPhone through iTunes account. Now let me know you how can you put music on your iPhone without using iTunes. Before I tell you the method, please remember iTunes is apple’s official media player so it would better if you use the iCloud method. Well, there are some ways to play music without iTunes, and the methods are quite safe. So, I am sharing two great ways with you. Install the Dropbox application on your computer. Install Dropbox on your iPhone and sign in. So, this is one of the ways to listen to music without iTunes. Now it’s time for another one. Want to hear to your music without the internet? Don’t worry; you can download option in song’s menu (the menu is three dots). Almost forgot to mention, you can also save your songs to your iTunes through Google Play music, and you can add fifty thousand songs in your Google play music account. In summary, these are the way to put and play music on your iPhone. So, now you can put and play music on your iPhone very easily and enjoy your favorite music anytime. How can Amazon Could Reader Help Me?